The 2015 Lunar Goat Silver Coin. 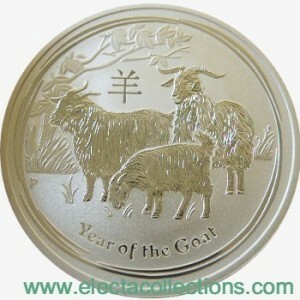 In 2015, the Perth Mint celebrated the Chinese year of the goat with the wonderfully crafted Lunar Goat Silver coin. With a 99.9% pure silver, the 2015 silver goat forms part of a highly collectible 12-coin series representing every animal of the Chinese Lunar calendar. As a result the coins are highly collectible thus highly valuable and promise an excellent return on investment. This entry was posted in World Coins Silver and tagged 2015, Australia, BU, Silver, Year of the Goat by Electa. Bookmark the permalink.